Today's customer is more informed and advent of social media have changed them from user to influencers in true sense, today the success of a brand lies in creating emotional connect with their Target Group (TG), one which changes "brand promise" to "brand action", Managing Director & Chief Executive Officer of NeoNiche Integrated Solutions Pvt. Ltd., Prateek N. Kumar told SME Times in an exclusive interview. He said that the era of "one size fits all" and "rack listed services" are over, Brands today does not talk about tangible products but intangible experience that they create. One way communication has changed to one to one and one to many, he added. 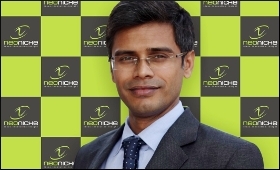 Please tell our readers more about your group - NeoNiche. What other services you have? In what ways you can help Small and Medium Enterprises (SMEs)? Prateek N Kumar: Our services helps our clients reach out to their Customers, Channels and Employees both offline and online to create positive connections .For SMEs we have a dedicated offering "SME Konnect" which works on basic cost of operation and profit sharing model. By doing this we take care that our SME clients are not burdened by huge budget constraints and every initiative pays for itself. Under this initiative, our SME clients get robust communication campaigns for their target audience across different geographies. It helps them reach out to a large audience and create focused loyalty programs for their existing client base. I also adds a professional approach to their sales pipeline creation. From Small and Medium Business (SMB) point of view...Brand or Product - which is more important? Prateek N Kumar: Not only for SMEs but for any enterprise, while "Product" is important the identity or "Brand" is what creates the connection much beyond the realm of a single product or service. However important a product /service may be for a particular time with time they tend to become obsolete but eventually the "Brand" takes the other offerings of the Organization forward. Why brand is so important? Your views. Prateek N Kumar: The moment you think you have got all the answers someone comes along the way and changes the very question, eventually new technologies, services and products are invented, upgraded and old ones are discarded ultimately itâs the brand which stands for the promise that we make to our Customers for current set of products and services as well as the new ones that will come in the future. What is Below the line (BTL) advertising? How important is BTL for promoting a brand? Prateek N Kumar: We do live in exciting times, where things change with a blink of an eye. Today speed-to-market with the right message, at the right time, through the right channel while maintaining brand consistency, coordinating with multiple internal and external stake holders, developing actionable insights are clear challenges that a brand faces and the same is better addressed by BTL Campaigns because they stress targeted and customer-centric communications and create more effective results and ROI metrics. What kind of brands seek to benefit most from BTL? Prateek N Kumar: Any kind of Brands from any industry as long as they carry relevant messaging and converts "Brand Promise" to "Brand Action" will benefit from BTL Campaigns . Why BTL is a better return on marketing investment? Prateek N Kumar: Today branding is a function of media fragmentation. More channels and more newspaper reaching out to diverse customer base, makes it harder for marketers to reach a truly mass audience. Simply stated, above-the-line marketing that utilizes generic messages to build awareness is no longer the best way to influence customer behavior. Also The shift from ATL to BTL spending is in part the result of changing consumer attitudes; more sophisticated consumers demand relevant messaging that engages them in a dialogue and allows them to interact with the brand through their preferred communication channels. Capital in hand is a big issues for most of SMEs in India. In that case what kind of marketing strategy is the best for them? Prateek N Kumar: Small businesses do suffer from lack of funds that a large enterprise enjoys; but that does not mean creating brand name is expensive. SMEs just need to find the most cost effective way to promote their brand. First do a little research and decide what will be the best medium to reach the target audience. Think of unique ways to communicate with their target audience. Apply innovative approach like Profit sharing rather than cost based model with "Agencies", or Utilize online tools. Etc. How you see the Social & Digital Marketing? Prateek N Kumar: As stated earlier we conceptualize multidisciplinary brand building strategies across different platforms be it online - digital and social, or on ground through customer contact programs, events and exhibitions through our value proposition of Ideas, Innovation & Insights. What do you have for start-up companies? Also suggest that what kind of advertising tool they must apply in their plan so they can generate more and more business? Prateek N Kumar: We have offerings like "SME Konnect" based on Cost plus profit model where we partner startups in true sense there are other offerings like "Seminar in a Box" where we template the touch points between Startups and their TG. Tell something about the importance of establishing an emotional connect with customers today. Why and How? Prateek N Kumar: The era of "one size fits all" and "rack listed services" are over, Brands today does not talk about tangible products but intangible experience that they create, One way communication has changed to one to one and one to many. Today's customer is more informed and advent of social media have changed them from user to influencers in true sense, Today the success of a brand lies in creating emotional connect with their TG, One which changes "brand promise" to "brand action" . I am interested in branding.